Travefy Professional is a software tool built for travel professionals to collaborate and create beautifully-branded quotes and itineraries for their clients. At Travefy, we love to hear how the software has brought success to travel businesses around the world. Below is Dr. Terika Hayne’s story, founder of Dynamite Travel. Dynamite Travel, LLC was founded in 2008 by Dr. Terika L. Haynes, a savvy business professional who sought to create a company that would assist customers in creating unique travel experiences. Dynamite Travel also assists customers with excursion planning, dinner reservations, and anything else that will make their customers feel like they are a VIP traveler. Which is why a beautiful and professional looking itinerary was a must for the Dynamite Travel team. At the beginning, the team was simply comparing Travefy Professional with another itinerary builder they had been using. “Ultimately, we ended up switching to Travefy since we liked the offered features more,” says Jessica Rodriguez, an assistant at Dynamite Travel. “The features are nicer than the previous itinerary builder we had used. It’s ‘flashy’! The final appearance of the itinerary we send to our clients is personally what made me want to continue using it after the trial period was over,” Jessica added. Now, this elite travel business can create beautiful and rich itineraries for their clients with the help of Travefy Professional! Read all of the stories. Check out these other quick stories of some of our all-star agents. 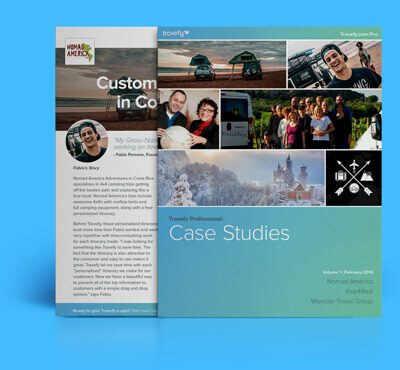 Learn how they use Travefy Professional to impress the socks off their clients and free up their schedule to tackle new business.